For a newbie, this may seem a little intimidating. But with the right tools, a little knowledge, and some practice, you'll be able to restring an electric guitar like a professional guitar tech. When I was gigging regularly, I would restring my guitar every week. My body chemistry is acidic and the sweat and oils from my hands would tend to dull the brightness of the strings as well as make them feel "dirty". For me, the bright sound and smooth feel of a new set of strings would inspire my playing. It became a ritual for me the night before the weekend's gigs started. I would sit in front of the TV and restring my electric guitar; my acoustic was much less frequent. You will need to set aside about an hour of time to do this correctly, but as I stated earlier, with practice you will know how to restring your electric guitar in about 20-30 minutes. The first thing to remember, do NOT remove all six strings at the same time. The guitar neck is designed to withstand the tension of the strings and if all of the tension is removed for any significant amount of time you could damage your guitar. Also, there are some guitars that are literally held together by the string tension. I remember reading a story about a guy who had recently gotten hired as a guitar tech for the Ramones. Wanting to make a good impression on Johnny Ramone he decided to restring his guitar for him right before the show. He removed all six strings and Johnny's Mosrite guitar literally fell apart in his hands. The string tension held the whole guitar together! What's worse, the bridge of the guitar bounced across the floor and fell down the air conditioning duct. If I remember the story correctly, they spent quite some time using a coat hanger and chewing gum trying to rescue the bridge from the duct. He retrieved it and managed to keep his job, living to restring the guitar another day. But not all six strings at once! But I digress. Some people work in pairs of strings at a time, I prefer to work on individual strings. You will quickly decide what works best for you. Use this article as a guideline to get you up to speed quickly. OK, let's get down to it. I always start with the high E string (personal preference); it helps keep me organized. If your guitar has a locking nut tremolo (whammy bar) system you will have to unlock it. It works best if you remove the clamps completely and work with just the nut until the restringing process is done and the strings are stretched and tuned. Then replace the locking clamps and fine tune using the tuners on the tremolo bridge. · Use your string winder and loosen the string until there is enough slack that you can unwind the string from the tuning post by hand. · Use your wire cutters to cut off the curled end of the string and discard. Do this to minimize the chance of scratching the finish of your guitar. Push/pull the string back through the bridge slowly making sure it does not drag across the body. You don't want to restring your guitar to result in refinishing your guitar! · Next, unwrap the appropriate new string. Insert it through the bridge of the guitar, over the saddle, up the neck, over the nut and into the hole in the tuning post. Again make sure the trailing end of the string doesn't drag across the guitar body. 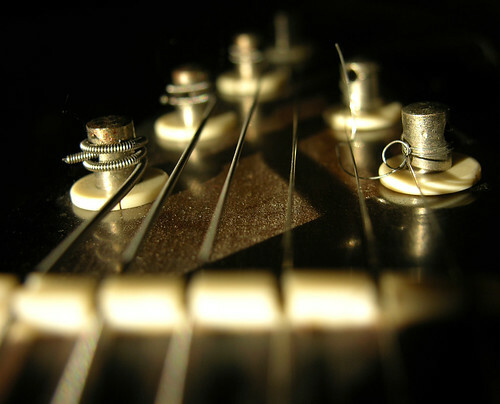 · Start turning the tuner by hand making sure the string wraps over the top of the tuning post. Ideally, you want to have 3-4 wraps of the string around the tuner, but this is nothing to stress over. · Turn the tuner until the slack is out and the string is properly seated in the nut and over the bridge saddle. · Next clip the excess string off close to the tuner and use your string winder to bring the string up to pitch. · Use your digital tuner and tune to pitch. · Next, grab the string with your picking hand halfway between the bridge and the nut and lightly tug the string away from the fretboard. Do not pull real hard, just hard enough to pull the stretch out of the string and tighten it around the tuner post. · Tune to pitch and repeat the stretching process until the string stays in tune. Now repeat the entire process for the remaining five strings. Know that the pitch of the new strings may fluctuate as you work on the remaining strings. This is especially true with a Floyd Rose or similar type floating bridge. When you have replaced and stretched the last string make sure all six strings are still in tune. If you have a locking tremolo system, replace the clamps for the locking nut, tighten, and use the bridge fine tuners to get the proper pitch. The final step is the best one; sit back, crank up your amp and enjoy. Make sure you play something with lots of note bending in it and make sure the stretch is all played. Take satisfaction in knowing that you now know how to restring an electric guitar.